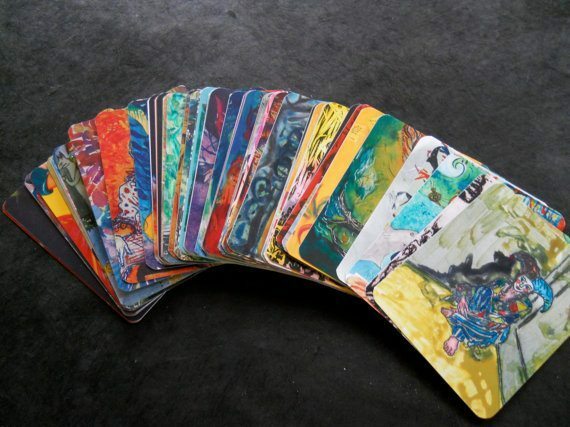 The Balance Deck is 72 cards of artwork and writing that can be used for fun, sharing, or introspection. Each card has an image on one side and the corresponding description on the other side. Simply fan the deck, pick a card that interests you, and read about the deeper meanings of that image. All artwork is subject to interpretation by the viewer, and will be a source of amusement, insight, and inspiration for you and your friends. The cards have been popular with women’s groups, therapists, and as conversation starters. While not designed as a divination deck, random card choices can be surprisingly synchronistic with the situation of the person selecting the card. Some original artwork is also available, please inquire about prices. Purchase your own Balance Art Card Deck at my Etsy shop! This entry was posted in Balance Art Card Deck, Products and tagged art cards, art prints, artist, balance, Balance Art Card Deck, Balance Art Cards, Catie Faryl, color prints, fun, gift, greeting cards, hostess, note cards, tarot cards on January 4, 2013 by Catie Faryl.